Finally! 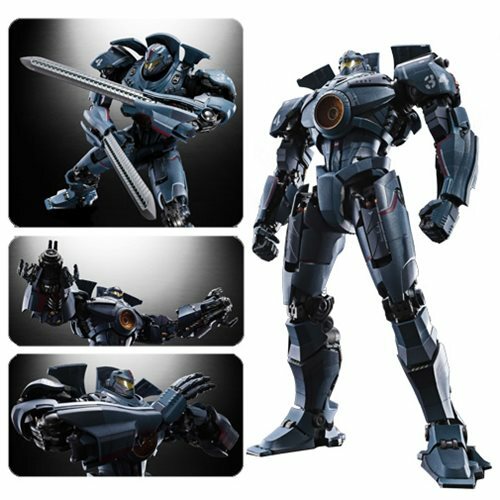 Pacific Rim, the mecha masterpiece from 2013, joins the Soul of Chogokin series with the Pacific Rim: Uprising GX-77 Gipsy Danger Soul of Chogokin Die-Cast Metal Action Figure! Made of die-cast metal, this is the long-awaited ultimate portrayal of the titanic robot fighter. It lights up in 3 places and plays sound for weapons and the start-up sequence. The figure includes 2x sets of hands, a ship, 2x chain-swords, 2x chain-whips, 2x plasma-casters, a stand, and instructions. Measures about 9 1/10-inches tall. Requires 7x "LR41" batteries, not included. Ages 15 and up.